For many organizations, adopting Health Rosetta components is one of the most direct ways to materially improve EBITDA. It's estimated by organizations such as PwC and the Institute of Medicine that 30-50% of all health care spending is waste, fraud, or abuse. If health care is 20% of your payroll expenses, this is is like a 6-10% perpetual payroll tax on your competitiveness. Organizations around the country, big and small, rural and urban, public sector and private, have tackled many of the sources of waste. The Health Rosetta simplifies adopting their best practices. Here's where you can get started learning more. The Health Rosetta is made up of specific components and strategies that enable you to repeat what others have done. While not exhaustive, here are a few major areas likely to have the quickest and most significant impact on reducing your total spend. Note that all Health Rosetta components and strategies must be proven to reduce your spend, your employees' out-of-pocket spend, and improve the quality of care your employees receive. See what the Health Rosetta could do for your bottom line. Must use a positive number. How much cost reduction would you like to achieve? Better health means less absenteeism and a higher performance workforce. Many of the most costly diseases and procedures are also the most commonly misdiagnosed. This leads to substantial suffering by your employees and their loved ones. We've all had terrible customer experiences in the health care system. Much of this poor experience is the result of poor design. Uncoordinated, improperly incentivized individuals and organizations results in a jumbled mess for patients. At best, this distracts your employees, reducing their productivity. At worst, it results in them receiving incorrect, improper, or lack of care that can seriously harm them. Organizations around the country, big and small, rural and urban, public sector and private, have tackled this by implementing key strategies, solutions, and benefits design changes.. The Health Rosetta simplifies adopting their best practices. The Health Rosetta is made up of specific components and strategies that enable you to repeat what others have already done. While not exhaustive, here are a few major areas likely to have the quickest and most significant impact on improving the quality of care your employees receive. More and more employees have high deductibles. The national average is around $1,400. Yet, more than half of Americans have less than $1,000 in savings. Much of your workforce may be one hospital visit away from catastrophe. As costs have gone up, employers have had to shift more costs to employees, despite spending more on payroll than ever. It's consuming 79% of all household income growth and is on track to consume 50% of all household income by 2021. 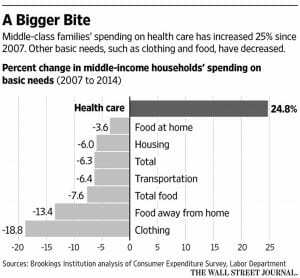 The Wall Street Journal reported that middle-class family spending on health care has increased 25% since 2007 alone. Smart employers make smart decisions free and poor decisions costly. Organizations around the country, big and small, rural and urban, public sector and private, have tackled out-of-pocket costs with far more nuanced and effective solutions than blunt force high-deductible health plans that often cause patients to forego care. Instead, these organizations incentivize smart behavior, such as selecting high-value treatment options, clinicians, and facilities. A six-week email intro to the Health Rosetta. CEO's Guide to Restoring the American Dream: How to Deliver World Class Health Care to Your Employees at Half the Cost. Tell us basics about your organization, current benefits, and goals. We'll help identify a tailored path.